I so wish I had seen last week BEFORE our beach party. This healthy and delicious looking beach treat is from the blog Hungry Happenings. She makes so many cute treats, you really should check out her blog for party food ideas of all kinds. I think I will have to go eat some fruit now, this picture is making me hungry. 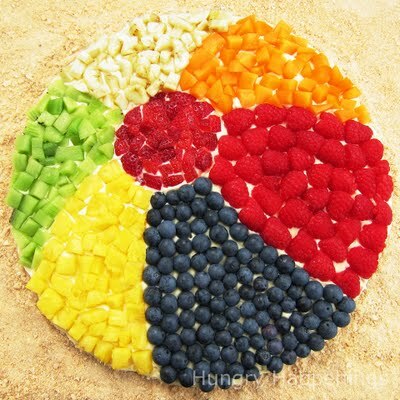 Thanks for posting a link to my Beach Ball Fruit Pizza. Sorry it was too late to make for your party. The girls look like they had a lot of fun even in the heat.